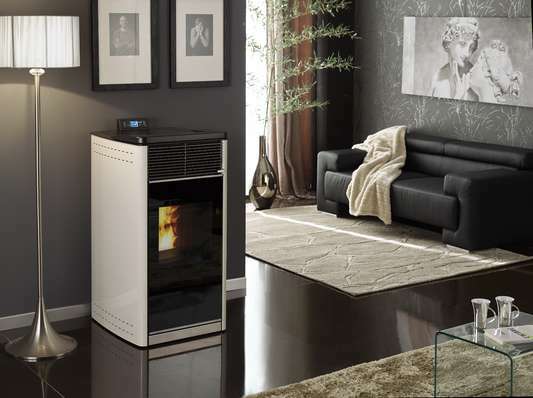 This Defra-approved in-room pellet boiler with internal hopper runs at 90% efficiency. The Star 18 has a highly effective hot-air system that gives out 5.2kW to the room and 12.7kW to water. It has a contemporary, streamlined design, and its outer door has a mirror finish that becomes transparent as the stove gets hot. The Star 18 is available in a range of colours (ivory, red, silver and matt black) and a choice of two tops: hand-decorated ceramic (top right image) and flat steel (top middle). The Klover Star 18 wood pellet boiler stove qualifies for the RHI biomass grant, this provides payments to people who use renewable energy to heat their homes. Click on the link to find out how much you could receive. If you need further information about this stove, please call 0844 3320157.